Pallets come with incredible super powers as they are strong, sturdy mold-able into any desired furniture piece. And icing on the cake is that they are so cheap and can be availed though possible easy ways. You can search them out in the old buildings, fields and shipping area or you can order them at the cost of dew pennies to get dropped at your door step. And there is an unlimited range of the projects that you can get from these repurposed pallets and some of the unique and awesome ones are right here with us. So, check out these DIY recycled pallet projects having four furniture types belonging to different sections of the house. The first focus is the outdoor space and here we got lovely kids dining set and a large size coffee table for the purpose of fun and gathering. The second one is the simple headboard piece with legs to magnify the look and beauty of your bed. Then we have the most unique and one of a kind project one have ever seen and that is the sleigh. You can enjoy the sleigh ride when there is snow all around you especially the kids would have hell fun on it. And in summers this sleigh can be turned into the most amazing looking coffee table to get yourself and the guests served. There is lot more to do with the pallets just get the pallets and get your hands dirty with. 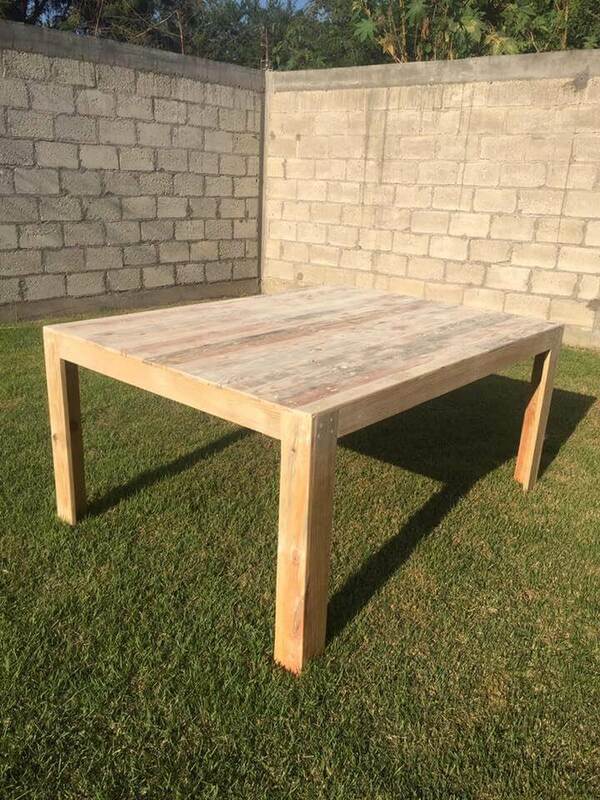 You can make this utterly cute dining set for the kids to have some picnic fun with their sibling or friends by eating, painting or drawing together on it.The cute little chairs and the table are simple in design so you can easily get them using the cut out pallet slat or planks pieces. Here we offer you this large size coffee table if you think your present coffee table is small to serve the crowd of your family and friends in the outdoor areas of the house on weekends or at festivals. The design so simple and feasible and would all be built with the simple pallet slat stacking method. This simple DIY headboard can really make a difference in the look and decor of your pallet bed for being rustic and natural and also completing the bed.Stacking the pallet pieces horizontally this headboard piece has been built with legs to stand sturdily at the back of the bed and give a more stunning and complementing look. This is an unusual pallet ideas done so far and would be so much fun to try at home yourself with simple and easy structure set. the seating of this sleigh would be simply done with pallet slat stacking on the sliding legs would be a little tough to so sharpy trimmed so that it can run fast on the snow.